Drawing bolts, nuts, standard parts and constantly moving, adding, and changing holes in an object. In truth, these aren’t my favorite tasks in the CAD world and I doubt they’re yours either. BricsCAD Mechanical automates repetitive tasks and gives you free access to 30,000+ components. Furthermore, the library even contains standard hole shapes and sheet metal parts. How cool is that? Plus, it’s super easy to make your own components. As a consequence, MCAD is faster, easier and smarter than ever before. Components, what’s all the fuss about? Choose from over 30,000 parts, all optimized to give the best performance to BricsCAD users. These components are parameterized and can appear on the same drawing multiple times, with differing parametric settings and are editable at any time. 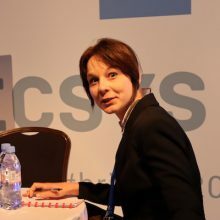 If you don’t yet know why parametrize is so cool, then check out Heidi’s post. Components are split roughly into two categories: Parts and Features. Parts; nuts, bolts, metal girders… Features; holes, ribs slots, pockets, forms… The really cool thing about features is that they can be set to automatically add and subtract from solids and sheet metals. This is pretty fun to play with, go on try it out. Components can have their own properties or inherit them from the parent object. Can I make my own components? Yes! Create your own components with V19. The BMNEW command opens a new window to create and edit the new component or modify within the assembly file. Store them locally or externally. Use BMEXTERNALIZE and BMLOCALIZE to switch components between these two settings. Reuse the same part over and over again. Once you’ve finished, use the BMUPDATE command to update components automatically from the main file. The BMMECH command converts Blocks and external references into mechanical assemblies automatically, meanwhile, BMUNMECH performs the task in reverse. Combine this with our new BLOCKIFY command and you’ll be whizzing through your projects. Edit a local component in its own dedicated environment using the BMOPENCOPY command which creates a separate drawing file just for this component. Finally use the BMREPLACE command to replace the current component, with the newly created one. How does this work with Array? Component arrays can be used on any component because they have the same properties as regular Associative Arrays. V19 makes use of Associative Arrays; rectangular, polar, and path, which will feel familiar to users. Special nodes in the Mechanical Browser display Arrays of Components making them easy to edit. Even in an array, components retain their parametric properties. This means that all component parameters are still fully editable within the Array. There is also the possibility to hide or modify an individual Component within an array. This streamlines the task of creating assemblies with multiple, similar configurations or objects with arrangements containing various bolts types. How do I manage this file? Once you have finished building your models, use the ETRANSMIT command to export the complete files as a package. This works regardless of whether the component files are stored internally, externally or in combination. It makes it even easier to share your project with others or to save a backup file. 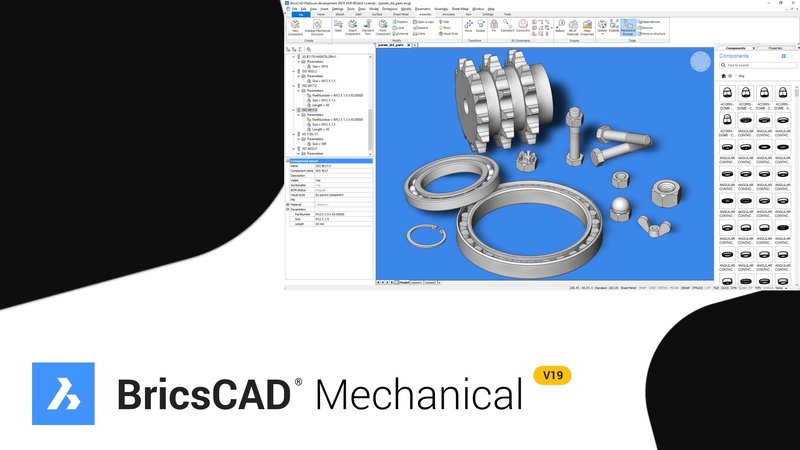 Ready to try BricsCAD Mechanical?